Welcome to my website about Seafaring Ancestors in the Age of Sail! My aim in creating this page is to share some of my fascinating research about ancestors who served at sea through some of (maritime) history's most stirring times, including the Colonial Wars, Revolutionary and Napoleonic Wars, and the period of peace which followed in which Britain had secured her dominance of the world's oceans! In almost ten years of researching my family's history, using the typical 'bog-standard' records such as birth marriage and death certificate, census records and good old family stories to get started in connecting generations, I have managed to take my paternal line back with 99% certainty some eight generations back to Michael Spinks, born in the mid-1760s allegedly in Borough Southwark, now South London, then in Surrey. Michael Snr. served his entire career (as far as can be ascertained) in the fighting ships of the Royal Navy, presumably starting out as a boy during the American Revolutionary War (1775-1783). By 1790 he seems had 'settled' in Portsmouth and has been found on the ship's books of the port-admiral's flagship HMS Barfleur - a huge ship-of-the-line (battleship) mounting 98 great guns on three gun-decks and crewed by 750 men - which he joined in January 1790 and served through the period of tension known as the Nootka Sound Crisis/Spanish Armament. Towards the end of his service in her, on 1st October that year, Michael was promoted to the rate of Boatswain's (or bosun's) mate! He was discharged the ship on 22nd December that year, and son after he appears to have fallen in love with a local girl named Susanna Room(s), and got her pregnant with their first son, Michael. 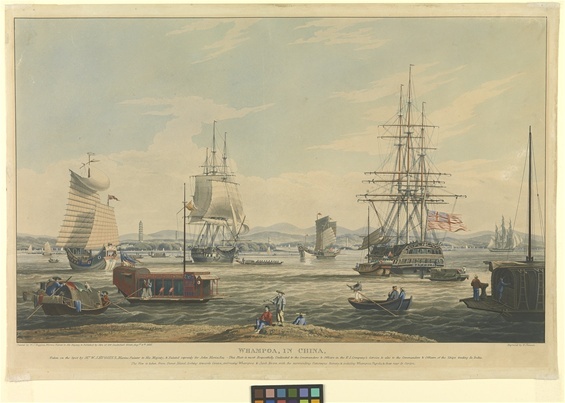 This image from c.1835 depicts ships lying at Whampoa Reach (with Canton beyond) on the Pearl River in China; one of the main trading posts of the British East India Company. At right of picture the ship 'Waterloo' is clearly seen flying the Company's flag. Hi, and welcome to my website. Here I’ll post news, stories and photos about things and subjects that interest me. Hopefully you’ll have as much fun visiting my site as I had creating it. If you enjoy the site, don’t forget to leave a message in my guestbook. If you have any suggestions or comments to the content on the site, you’re also very welcome to send me a mail through my Contact page.